I haven't had bangs in well over a decade, but somehow or other, I recently acquired a few stray hairs that are significantly shorter than their neighbors. I would never have noticed them except that they're right at the hairline off my forehead. I don't know if they were weakened last time I got it colored, and so broke; or if the stylist somehow cut them off during my last trim. But they're there. 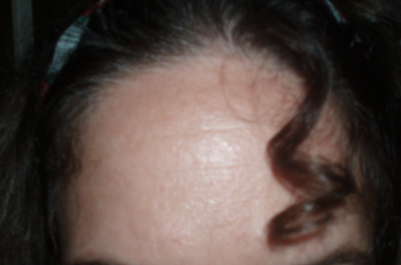 And they form a little ringlet that sometimes escapes when I pull my hair back, and sometimes I think it looks really cute and sometimes I find it really annoying. This page contains a single entry by Holly published on September 8, 2007 9:57 AM. A Raging River of Molten Cheese was the previous entry in this blog. Using Your Granddaughter as Pin Cushion is the next entry in this blog.